Every time I see those horrifically predatory Money Mutual & Capital One ads on television, attempting to trick you into believing the debt you are about to take out with them is really free “cash” , I cannot help but notice the great lengths they go through to have a happy commercial and make getting your “cash” seem easy and friendly. But the point of this blog is not to hammer Money Mutual & Capital One . . . again. The point of this blog is to show how the smoke and mirrors of these commercials distracts you from the reality of debt which is … LEVERAGING YOUR FUTURE INCOME TO HAVE SOMETHING NOW! In other words, whatever you want to buy now, you have to give a small piece of your income stream to this debt obligation. Follow me on this analogy. Think of your whole take-home income as a pie, with a large slice going to your housing cost like rent and utilities, another slice going to your vehicle and transportation cost, and yet another slice going to pay any current debt. Many people look to take out more “cash” debt to pay for existing debts or necessities like car repairs, medical expenses, etc. 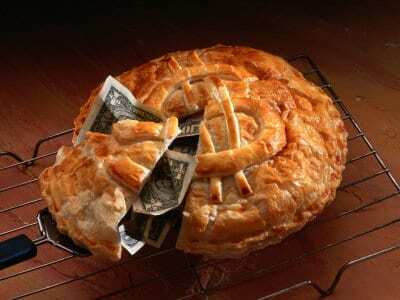 For most people their “pie” is already sold to all these above obligations. Meaning they have no ability to pay off all their debt if they had to do it today. So not only is today’s pie sold, but tomorrow’s pie, too– and all their pies for many years to come. Nevertheless, many people continue to sell pieces of future pies until they will never be able to deliver as many pies as they have sold. For many, the hope is that increasing income will unbury them and their pie factory. For others, their dreams and sanity hang on the unlikely hope of hitting the lottery or some other fantasy. It is easier said than done, but you have to STOP SELLING THE PIE.